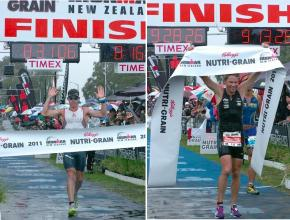 This Saturday, Cameron Brown won IM New Zealand for an amazing 10th time. The women’s race was an unexpected win by Sam Warriner. Here is a closer look at the results. This means that New Zealand is usually about a quarter hour faster than IM Hawaii (which has a course rating of 2:50), but this year was about 11:30 minutes slower than usual. This is pretty much in line with the horrible race conditions. Among the top athletes, Cameron was the one that was least affected by the conditions and landed a really convincing win. Petr Vabrousek was also even better than his expected time, but was passed by Scott Curry who really improved on his prior results. Top rated Mirinda Carfrae had two flats on the bike, and she just edged out Jo Lawn. Kate Bevilaqua and the the other previously unrated women also performed well, posting solid times and provided some close racing. Since my last post, I’ve worked a bit more on the results and ratings I have on file for IM New Zealand. Here is the full data! 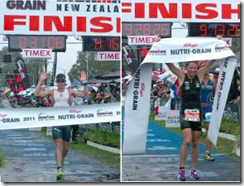 I’m preparing a longer post looking at the upcoming IM New Zealand race. For now, I have two short teasers. The course rating of 20:32 means that on an average day Cameron Brown (rated 8:37:41) is expected to finish around 8:17:19. Based on the ratings, Cameron Brown still has to be considered the favorite. However, Terenzo Bozzone and Mathias Hecht are not so far off that Cam can be certain to win for the 10th time. After these three athletes, Keegan Williams and Petr Vabrousek may be good enough for a podium finish if one of the top 3 ranked athletes run into issues. After the top 5, the field is not very deep and the ratings are quite a bit slower than the top athletes. There will be more …. Please let me know in the comments if there is something else that you’d like to know and that I may be able to answer by analyzing the athlete’s previous results. 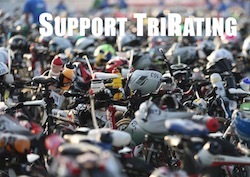 I’ve put some more work into TTR – Thorsten’s Triathlon Rating. With IM Florida I added a third course (and six more races from 2005 to 2010) and I also managed to include female pros. One thing that I have to think of now is to make sure that I’m working on high quality data – I was able to catch a few obvious problems, but I have to do some more systematic work on that. An interesting little tidbit: The athlete with the most results in my database is Petr Vabrousek with 14 results! He’s also way ahead of the next athletes, who “only” have 9 races (Christophe Bastie, Michael Lovato, Heather Gollnick and Tamara Kozulina). Dirk Bockel moved a few spots down with his 8:21 in Florida 2010 (which was adjusted to an 8:44). Raynard Tissink fell out of the top 10 – his two great Kona results were joined by a not-too-stellar 8:40 in Florida 2009. He was replaced by Rasmus Henning. Macca is still in the #1 spot, but it’s getting very close between him and Crowie. The first two spots are not a surprise – Chrissie and Rinnie are currently the top athletes. What is interesting is the large gap to the next spots – more than 20 minutes! For me, Michellie in #4 was a bit of a surprise – her last race was in 2008 and to me I did not really think of her as an active athlete that might show up in the ratings. Another interesting thing is the Total Rank that shows how the females would rank in all athletes (i.e. male and female). Chrissie, for example would be ranked #54 – which means that there are 53 males that have a better rating than she has. Even if some of her great results from Roth are not in the database yet, it’s hard to see her crack the Top10 in Hawaii or the male ratings. In the last week, I’ve worked to include a second course into my triathlon ratings. As I want to include races as the year progresses, I wanted to work with races that have been between IM Hawaii in October and today. As far as I know, these races were IM Arizona, IM Florida, IM Cozumel and IM Western Australia. Again, Craig Harris helped by providing race results for Arizona and Florida. For no particular reason, I chose to start with IM Arizona. IM Arizona of 1161, it means that IM Arizona is 1156 seconds faster than IM Hawaii (almost 20 minutes – or 19m:16s to be exact). To put this in another way: Chrissie Wellington’s blazingly fast 8:36:13 in Arizona 2010 is the statistical equivalent of an 8:54 in Kona – a bit faster than Mirinda Carfrae’s winning time of 8:58:36, but still short of her own course record in Kona. Of course, there are a lot of ifs and buts with these comparisons, but I really like to play around with the numbers without taking them too serious. There are two main changes compared to the last rankings. Timo Bracht has entered the Top10 – this will be analyzed in the next section. The most obvious change, however, is that we have a new number one: Chris McCormack. Andreas Raelert has moved down from 1st to 3rd. This is a “result” of his performance in IM Arizona in 2008. Even though he won his first IM in 8:14, as this was on a fast course the adjusted result is “only” an 8:35. This “bad” result brings down his rating quite a bit. It’ll be interesting to see how his rating will change when I include IM Germany where he had two faster results. In order to favor newer results over older results, I include an aging factor. After playing a bit more with different values, I’ve adjusted the factor to 0.85. This results in a few little shifts in the Top10, but also to a new number 9 with Timo Bracht, instead of Cameron Brown (who is now ranked #12). When I look at these results, then Timo was the faster athlete in 2006, 09 and 10. Cam’s result in 2008 is much better than Timo’s in 2007, and Cam had the better result in 2005. All in all, it seems that the “old” result of 2005 shouldn’t carry so much weight any more and Timo should be ranked in front of Cameron. This was achieved by a relatively small adjustment in the age factor. It’ll be interesting to see what happens when both athletes home races (IM New Zealand and IM Germany) are added to the ratings – both have had their most impressive results on their home turf.